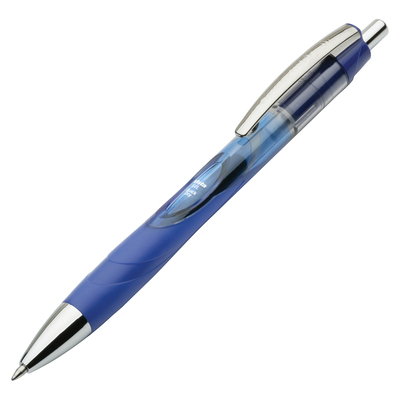 Features a safety clip that when pulled away from the pen retracts the point. Visible ink supply. The clip and barrel grip match the ink color. No more mishaps. This refillable retractable gel ink pen is tinted the color of the ink and is transparent enough to allow the user to monitor the ink supply levels. The clip and barrel grip match the ink color. The pen has a safety clip that when pulled away from the pen retracts the point preventing leakage prolonging the life of your pen and protecting your pockets, handbags and briefcases from stray marks. Smooth gliding, acid-free ink will not fade, run or smear.